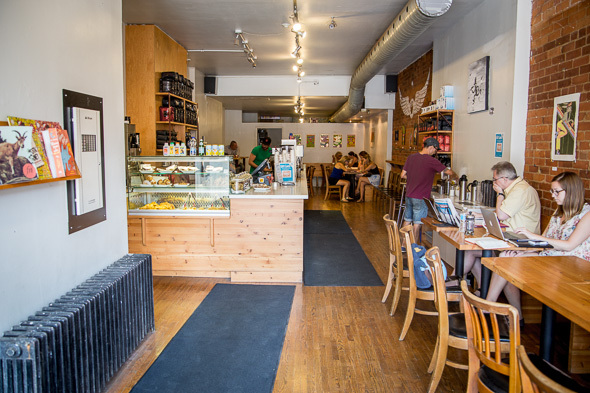 Manic Coffee opened its doors at Bathurst and College exactly six years ago, and it's been a haven for regulars ever since. Manager Luis Pereira says no matter what the weather, the same people come in the door each day, and he starts making their drink as soon as he sees them. 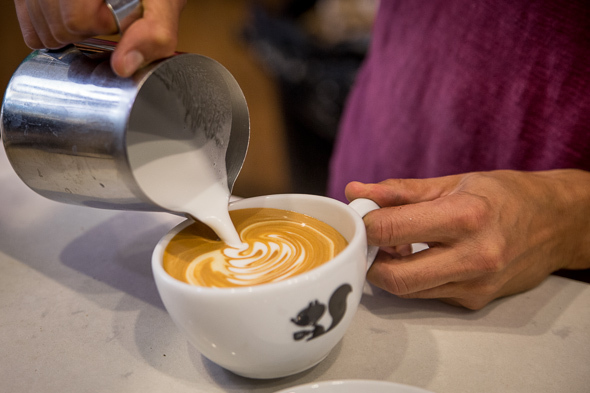 Manic serves up direct trade brew from the likes of Social and Intelligentsia . They make all of the classics, like cappuccino ($3.24) and Americano(s) ($2.76). But they also started making cold brew coffee about two years ago, a trend which took awhile for other cafes in the city to pick up on. I stop in on a sweltering day, and opt to sample that, as I'm already acquainted with the superiority of their hot drinks (which always include fantastic latte art, in case you happen to be visually inclined at). The cold brew is as good as any I've tried in the city so far. It's got the desired fruity flavour, and I would say it's perhaps the most concentrated, too, which is a common effect of steeping the grounds for such a long time. In Manic's case, Pereira says, it's anywhere from 12 to 24 hours. 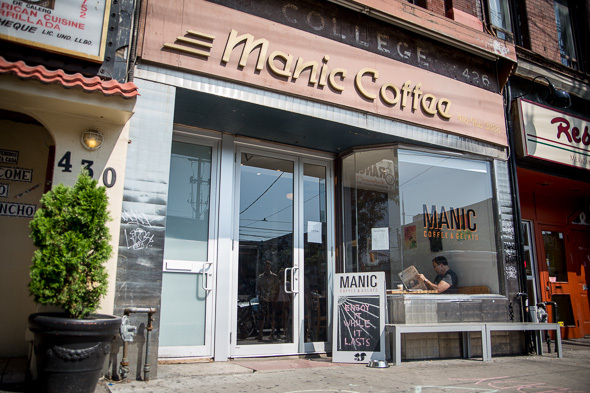 Over the relatively few years it's been open, Manic has reinvented itself to a considerable degree. Since we first visited, they've gutted and re-outfitted their kitchen. 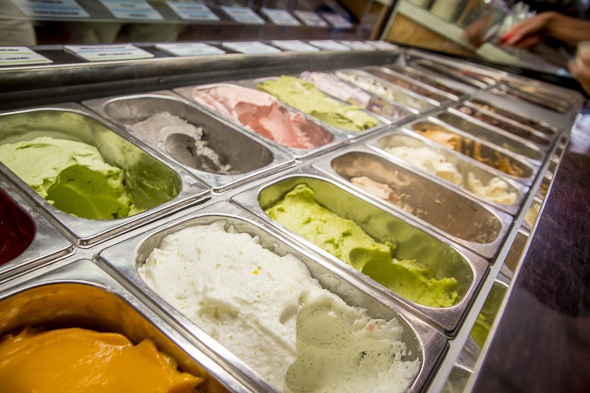 The best thing to come of that is their gelato, which is all made in-house. By "made in-house," I mean they even go so far as to roast their own pistachios, which garnish the pistachio flavour. Pereira hooks me up with samples of several, with coconut lime and chocolate orange as clear standouts. I finally settle on a cup of chocolate hazelnut, though, because I am an addict. And, people: it was a good choice. In case you're inexplicably not down with gelato, (they have vegan options!) 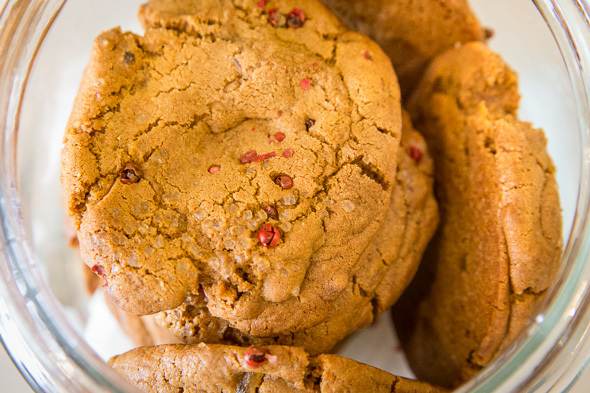 Manic also creates all of their baked goods on site. That means fresh cranberry-white chocolate scones, and blackberry-blueberry muffins, too. They also do panini, in case you're weird like me and enjoy lounging in cafes literally all day long as though you have nowhere else to be (I don't). One warning, though: Manic doesn't do the whole WiFi thing, and that isn't about to change. They are internet-free because they want to foster a community atmosphereâand it works. The cafe is absolutely crammed at 2 p.m. on a weekday, with people actually speaking to one another as opposed to burying their heads in laptop screens. Don't be scared, though: do your research in advance, save whatever you need on your computer, and go make a new friend or two. Thanks to the New Listerine UltraClean for sponsoring our coffee-fueled adventures .